2) Transfer to 509 or 510 Harbourfront Streetcar Towards Exhibition. 3) Get off at Queens Quay West at Rees Street. Valentine’s Day is approaching; do you wish to have a romantic evening with your beloved one, your family, or friends? Do you wish to meet the one in a special evening this year? 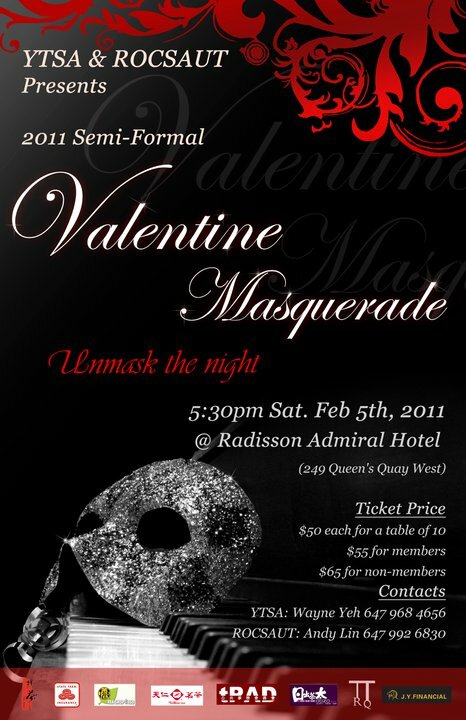 Taiwan Republic of China Student Association at the University of Toronto (ROCSAUT) and York University Taiwanese Student Association (YTSA) are pleased to present our annual semi-formal event: 'Valentine Masquerade- Unmask the Night' at the Radisson Admiral Hotel, overlooking the beautiful night scenery of Lake Ontario on Saturday February 5th, 2011. This evening's theme will be Valentine's Day, with performances from both clubs' dance crew and ROCSAUT's Allegro Choir. There will be a buffet full of delicacies, great prizes to be won with our raffle ticket draw, and many interactive activities for a fun and fulfilling night! This year, we have arranged a speed dating game for all single ladies, gentlemen, and couples to have closer relationships. ROCSAUT and YTSA invites you, your family, and friends to come enjoy this romantic and joyful evening! ouu a Valentines Day event! Please check the updates in 'red colour' for how to purchase your tix!! hmmm, who would like to sit with me!!! Can't wait to win the first prize!!!! I want to go to U.S!!!!! Thank you all for support and hope you enjoyed the night! Please take a good rest and best of luck on all your midterms, assignmnents, and work!!! During Reading Week: SKI-TRIP !!!!! Hope to see you all again there~~!! !